Lekker Bikes produces a range of bikes to suit a range of riding styles as well as riding purposes. Two bikes in particular from the range are, the Lekker Sportief and the Lekker Jordaan. Both present Dutch Styled Cruiser Bikes – both ideal companions for getting you in and around the city, however also to wherever it is that you may be needing to get to – of course, out of the city too! This blog post aims to outline the differences between the two models and in doing so, assist you in determining which ride may be more suited to you and your biking needs – either the Sportief or, the Jordaan. Read on to hear about what each bike has to offer and, in doing so, which style may be more suited to what you may be needing and where you’re looking to get to. Lekker Bikes do have both a Women’s and Men’s model for each style and this blog post, will be focusing on both of the Women’s Models. Beginning with the Sportief Model, immediately you’re able to see that it has been designed with a step-through frame. This enables you with unparalleled ease in getting on and off of the bike – without the need to lift your leg over a high top-tube that is common in many other bike designs. The Sportief can be seen as the people’s choice. In saying this, it has been designed to provide a quality, everyday ride – being value focused and a reliable choice for the everyday cyclist. Coming fitted with a front-basket, it immediately allows you a carrying-capacity for whatever it is that you may be needing to transport. Whether it be to the market and back with some fresh fruits and vegetables or, your handbag whilst you ride to meet a friend for a cup of coffee – the front basket indeed can be very functional, saving you from having to use something such as a backpack to carry your things. Which at times, can result in squished items along with a bit of a sweaty back. The Jordaan can be seen as the prototypical Classic Dutch Transportation Bicycle. Fitted with a few modifications in comparison to the original-styled Dutch cycles, it has been designed with modern commuting and transport at the core of its duties. Along with the Sportief too, it comes equipped with a step-through frame enabling ease of mounting on and off of the bike. 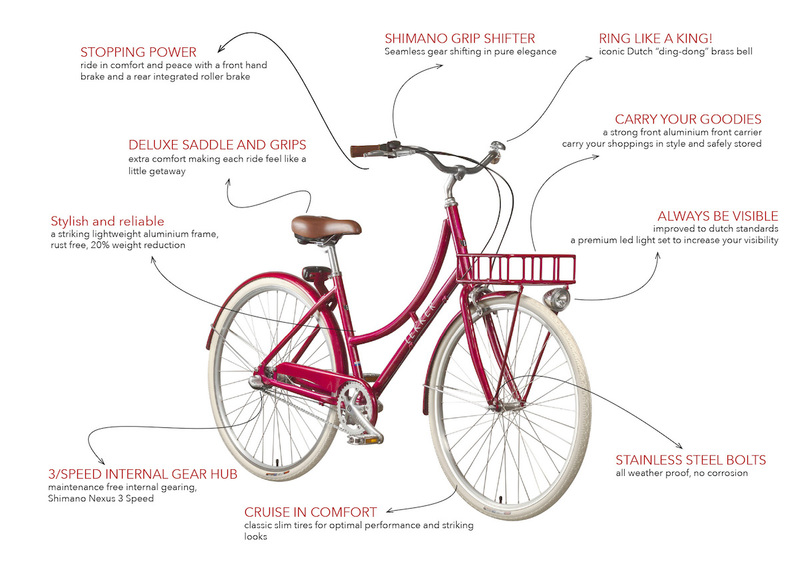 The Jordaan Women’s Bicycle can indeed be seen as the modern-styled commuter of the two, with function as well as comfort as the central two elements that define its role in the range. Regarding the Lekker Jordaan componentry, it offers fat tyres, a double hand brake (as with the Sportief too! ), and quite possibly – the most comfortable saddle you’ll experience. It comes fitted with an internal gearing system fitted with seven different levels of resistance available (the Sportief fitted with three). In offering seven as opposed to three, the Jordaan can also be suited to riding around the city (much like the Sportief) however, in addition to this – it can also allow for an increased level of ease when it comes to tackling the hillier or slightly steeper terrain – such as on outer-suburban trails or out in the Country. With carrying capabilities for the Jordaan available both on the back as well as on the front of the bike (with an added rack-mountable system, with an optional basket), it could be said that it’s the more stylish choice of the two – whilst simultaneously providing you with that extra room to carry those goods. Taking these last two aspects into consideration – gearing as well as carrying capacity, the Jordaan could be seen to provide you with a few more options when it comes to terrain, and, transporting your extras. 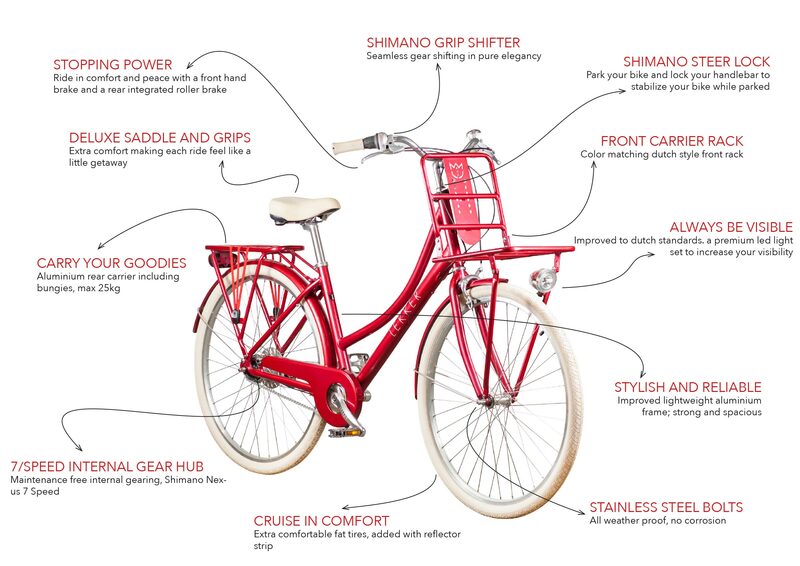 To learn more about the Jordaan, check out our article, ‘Classic Cruiser – A buyer’s guide to the Jordaan Series’. Both bicycles indeed present you with a quality riding option when it comes to getting around town on two wheels. Helping to not only do your bit for the environment however, whilst doing so, staying classy too! Both bicycles present great options for inner-city riding due their comfort levels, ease of gear shifting and use of an internally geared hub – said to make maintenance issues quite possibly a thing of the past. Both provide nice carrying capabilities too. If presenting them both within a nutshell, it seems the 3-speed Sportief – with it’s appropriate carrying capacity and three-speed system, would be ideal for inner-city cruising – to work and back, around the inner-city suburbs or anywhere where there presents flat and stable terrain. The Jordaan on the contrary, is able to do all of these things too however, with the added ability to provide you with a little extra carrying capacity if you’d need it. Along with this, the 7-speed system may be more suited to the outer trails and paths that can present themselves as a little less stable and, with a little more hilly-terrain. We at Lekker, hope that the above information can provide you with a clearer idea when it comes to choosing a Lekker Bike for you and your needs. Whether it be the Lekker Jordaan or the Lekker Sportief or really, any of the bikes within the Lekker Range. We hope we’re able to assist you in that next step towards choosing a Lekker Bike and taking you from where you are, to wherever it is that you may be needing to go.